These beautiful violet flowers look like dandelions. A perennial plant with thick woody root-stock, and tufted, branched, prostrate hairless stems upto 60 cm, sometimes 10 cm or less. Lower leaves are slender-winged, stalked or dilated into a large round toothed lobe at the base, pinnately cut, distantly lobed, endmost lobe ovate- heart-shaped, pointed-mucronate, sinuate-toothed, 5-15 cm long, terminal lobe 1.5-3 x 1.5 2 cm, leaf-stalk 4-15 cm long, hairy or glandular hairy. Flower-heads are borne in panicles. Flower-heads are bell-shaped,13-15 florets, densly hairy, stalked, flower-cluster-stalk bracteolate. Involucre phyllaries 12-15, 3 seriate, green to blackish, blunt, outer ones 2-4 x 1-1.5 mm, ovate- lanceshaped, middle ones 5-7 x 1-1.2 mm, lanceshaped, inner most 11-13 x 1-1.2 mm, linear- oblong. Florets are blue or purplish. Seedpod is 5.5 x 1 mm, almost black, elliptic-oblong, 5-ribbed, narrowed into 1.5 mm long, pale beak; pappus biseriate, 6-7 mm long. 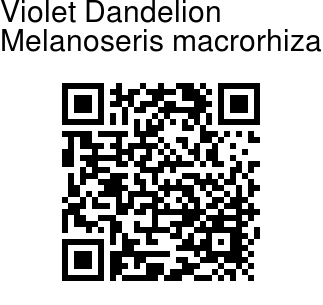 Violet Dandelion is found in the Himalayas, from Pakistan to Bhutan, at altitudes of 1800-4300 m. Flowering: July-September. 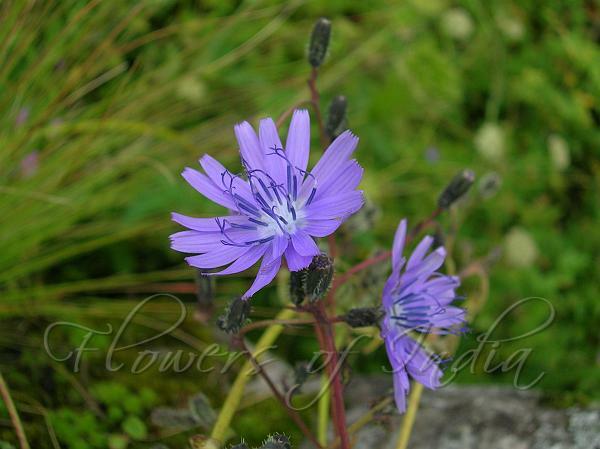 Photographed in Valley of Flowers & Mussoorie, Uttarakhand.